Apair of soldiers were the top finishers as approximately 35,000 runners persevered through difficult weather conditions to participate in the 33rd Annual Army-Ten Miler in Arlington, Va., and Washington, D.C., Oct. 8. Army Spc. Haron Lagat of Fort Carson, Colo. was the overall male winner, finishing with a time of 49 minutes, 23 seconds. Army Spc. Susan Tanui, also of Fort Carson, was the overall female winner, completing the course in 56 minutes, 50 seconds. Conducted by the U.S. Army Military District of Washington, the Army Ten-Miler is the world’s third largest 10-mile road race. The USA Track and Field certified course started and finished at the Pentagon, and took runners through a scenic and historic route through Arlington and the District of Columbia. At 10:08 a.m., well after the elite runners had finished, organizers reclassified the event from a competitive race to a “recreational run,” shortening the course by approximately one mile due to unseasonably high temperatures that approached 80 degrees and humidity that soared well above 80 percent. Participants who completed the full course after 10:08 were given an official finish time, but were ineligible for official awards. Those who completed the shortened course were credited with “finisher status,” but their finishing times were not compiled. “The safety of our runners is paramount,” said Jim Vandak, Army Ten-Miler race director. Throughout the morning, numerous racers and spectators were observed falling ill in the stifling conditions. A joint military medical team partnered with Fire and Emergency Medical Services personnel from Arlington County and Washington, D.C. to provide the first response. “It was really hot and muggy,” said Army Sgt. 1st Class John Camarillo of Headquarters and Headquarters Company, 1st Battalion, 3rd U.S. Infantry Regiment (The Old Guard), who completed the race as a member of one of four teams representing Joint Base Myer-Henderson Hall (JBM-HH). 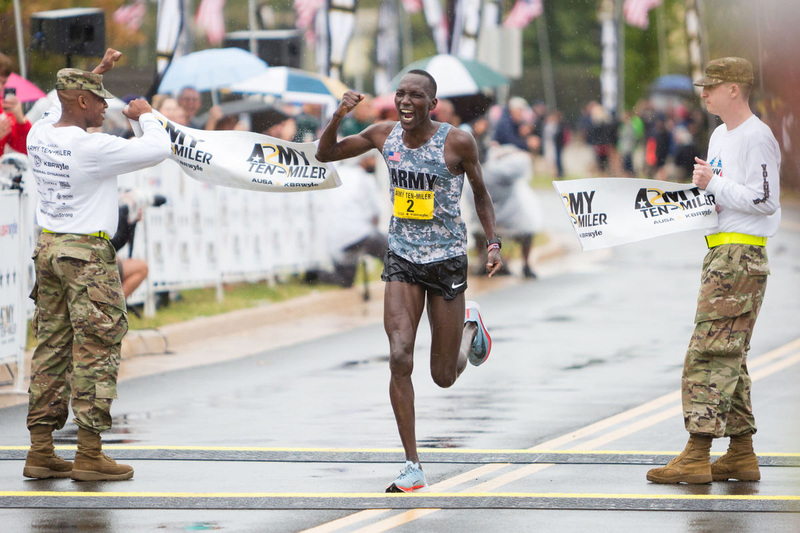 Several elite competitors underscored the ways in which the Ten-Miler embodied and promoted Army values. Running in his 6th Army Ten-Miler, Army Maj. Shane Mantz, a reservist from Lancaster, Pa., said he and his family were particularly inspired by the example of fortitude and resilience set by the more than 150 Wounded Warriors and wheelchair athletes who participated in the race. He also noted the symbolic significance of the race’s location in the nation’s capital.